Welcome to ComingSoon.net’s look at all the top titles arriving this week on Blu-ray, DVD and Digital HD. Check out the gallery viewer below for a look at the major new releases, catalogue films and television collections hitting shelves and/or VOD beginning Tuesday, February 21, 2017. Billy Bob Thornton is back as Willy Soke in Bad Santa 2. 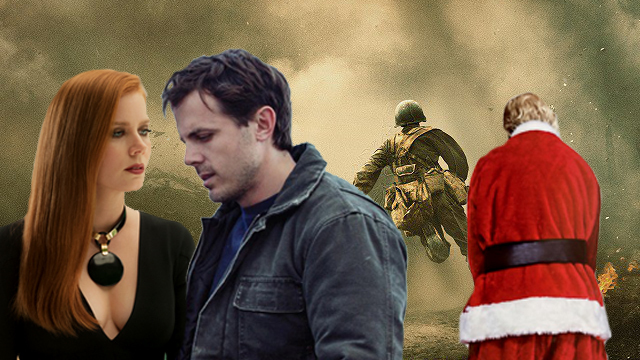 The comedy sequel joins a trio of Academy Award-nominated features with Tom Ford’s Nocturnal Animals, Mel Gibson’s Hacksaw Ridge and Kenneth Lonergan’s Manchester By the Sea. We’ve even got an exclusive behind the scenes look at Hacksaw Ridge. In the player below, you can go behind the scenes and learn a bit about the true story of Andrew Garfield’s character, Desmond Doss. The Criterion Collection this week offers two very different cinema classics. First up is Michael Curtiz’s 1945 Mildred Pierce, which earned star Joan Crawford an Oscar. Then there’s the early Pedro Almodóvar comedy drama Women on the Verge of a Nervous Breakdown, arriving in HD for the first time. Warner Archive this week brings to Blu-ray Ken Russell’s 1971 musical comedy The Boy Friend. Fans of French cinema should be on the lookout for Shout! Factory‘s release of the 2014 live-action Beauty and the Beast, starring Léa Seydoux and Vincent Cassel, as well as the Cohen Film Collection’s 3 Classic Films by Claude Chabrol. The set brings to Blu-ray Betty (1992), Torment (1994) and The Swindle (1997). The recent Christmas special Doctor Who: The Return of Doctor Mysterio comes to Blu-ray. The second season of Netflix‘s Grace and Frankie, meanwhile, arrives on DVD only. Digital HD releases hitting February 21 include the horror thriller Incarnate and the post-apocalyptic thriller Man Down, in addition to a pair of Oscar nominated titles. Natlie Portman headlines Jackie, currently up for three awards, while Walt Disney Pictures delivers their acclaimed animated musical Moana, itself nominated for two Oscars. You can check out cover art for all the February 21, 2017 releases in the gallery viewer below alongside a listing of each release’s special features (where applicable).